The Kingdom Hearts 3 space exploration with your Gummi Ship may not be for everyone, but if you intend on completing the game 100%, then you need to spend some time with it. Destroying the Schwarzgeist, menace of the Ocean Between is without a doubt the hardest Gummi Ship-related task, because it's essentially defeating the hardest space enemy. 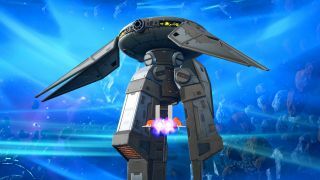 You'll perish instantly if you try too early, so adhere to our tips and you should be able to take out the Kingdom Hearts 3 Schwarzgeist and earn the Kingdom Hearts 3 Thermosphere trophy/achievement, along with the Golden Highwind ship. First off, you need to know where to actually find the Schwarzgeist to be able to defeat it. If you've flown around Misty Stream - the second galaxy you find, with Arendelle, Monstropolis, The Caribbean, and San Fransokyo - you'll no doubt have seen the enormous whirlwind in the centre with a green hue. This is where the Schwarzgeist lives. The only problem is, if you try to fly in with a ship that's too slow, you'll be refused entry. So the requirements to actually fight the Schwarzgeist are that you require a speed of 200. This isn't easily achievable, but one great pre-built ship you can acquire is the Endymion. You'll obtain this once you photograph the Endymion constellation, which can be found in our Kingdom Hearts 3 constellations guide. While the Endymion is just fast enough to get you inside and has a lot of health, unless you have the required materials, you can't actually edit the blueprint and change any of the abilities. If you're struggling, we'd recommend creating your own ship. Before you start building your own ship, make sure you level up considerably. We tackled the Schwarzgeist at around level 80, which gave us a considerably higher budget for installing blocks and weapons. As you can see, we took the Highwind Peak as a base and made some serious modifications.It doesn't look pretty, but it does the job. Your first focus is reaching 200+ speed, so get rid of anything surplus to requirements and add some speed blocks like Rocket/G and Booster/G. Next, go into the abilities and increase Cost Converter to level two. This will get rid of the two Teeny Ships you can have alongside you in exchange for an increased budget. Let's be real - the Teeny Ships aren't particularly useful. The Schwarzgeist deals insane damage with each shot, so you want to increase your health points to around 1,000. This isn't absolutely loads in the grand scheme of things, but as long as you're competent at rolling and dodging shots then it will be enough. Offense is the last key factor you need to consider when building your ship. If you go for the Highwind Peak as a base like us, get rid of most of the weapons and replace them with things like the Comet/G and Meteor/G because they automatically fire homing missiles that deal immense damage. We also went with two Graviga/G-02s because the impact of those shots couldn't be ignored. These are all cannons, so in the abilities, you're best off ramping the Cannon Upgrade to level three. With the rest of your ability points, throw them into HP Upgrade, Defender, Auto-Life, Heal Upgrade - anything that will help keep you alive. The final thing you need to do before you embark is equip the Repair Kit as your special weapon. Combined with abilities like Heal Upgrade, the Repair Kit will heal you for around half of your total health each time. Pretty nifty. With each shot from the Schwarzgeist, it can take a serious chunk out of your health total. Even with the increased health, you're going to want to make sure you're rolling and dodging everything it throws at you, especially the orange laser grid and the rockets. When you beat the first main phase, you need to beat a tiny flying robot with more health than you'd expect. As soon as it stops flying around the screen like a whirling dervish, get out of the way because it's about to charge at you. The Schwarzgeist's main form of defence is a circular shield that often comes out in threes. As soon as they appear, focus on taking them down because their shield parts will regenerate after a few seconds if you don't deal enough damage to them quickly. Take them down and you can focus on shooting the big baddie itself. That's pretty much it! The Schwarzgeist doesn't have many tricks up it's metal coated sleeves, but the ones it does have can kill you very quickly if you're not careful. That's why we find healing your way to victory is the best method - it may take longer than investing completely in offense, but it's much more reliable. When you do eventually take down the Schwarzgeist, menace of the Ocean Between, you'll also unlock the Golden Highwind ship which is the best ship in the game. It has a phenomenal budget of 3,853 - seriously, this thing is a monster. Have you found all of the Kingdom Hearts 3 lucky emblems yet?